The Miele Swing H1 QuickStep is a lightweight upright stick vacuum with stylish design and surprising performance. Similar to their other larger vacuums it is built to produce strong suction via a high flow of air without the excessive noise that other brands put out. And also like their popular canister lineup the Swing H1 works just as well on hard floors like tile, laminate, and hardwood as it does on carpeting. A variety of configurations and attachments means you will have the right setup for any surface. While you won’t want to use it exclusively for large carpeted homes it is an ideal choice for smaller apartments, kitchen spaces, offices, and even campers since it is so portable. Some of the highlights of this model include a fully sealed filtration system with optional HEPA filter, 1000 watt motor with dual speed settings, and their newly designed FiberTeQ Combination floor tool that performs well on low to medium pile carpets and smooth floors. It is easy to transition from one room to another via different floor settings and for those thicker rugs there is also an optional PowerBrush. When deep cleaning is necessary it is recommended to use spinning brushes as they will agitate embedded dust particles so they can be pulled into the machine. Here is a more indepth look at the main features of this vacuum cleaner that really set it apart from other stick vacuums. The motor is quite powerful and puts out 1000 watts. This provides more than enough suction for smooth floors and it does a decent job on most carpets up to medium pile or height. The head will seal fairly tight to the flooring so there is not a lot of air escaping out the side. This reduces the blowing of dust and helps the motor produce a steady stream of suction. It is also balanced internally and has sound absorbing material around the housing so it is quieter than other upright cleaners of similar size. The H1 Powerline has a two speed suction control to give you all the control you need for every surface from thicker carpets to throw rugs, and even curtains. For delicate items you need to dial the power way back and this lightweight Miele lets you do just that. This is another feature not typically found on stick vacuums. The Miele Swing H1 has the same multi layered filtration design as their other vacuums. The airflow is directed through their IntensiveClean™ dust bag as well as a secondary electrostatic charged filter to grab even more of the fine dirt particles. Whatever is left will be trapped by the Super Air Clean exhaust filter before the air finally passes back out of the machine. An optional HEPA filter can be purchased for those who suffer from indoor allergies or have asthma. These multiple layers are proven to trap virtually all of the finest dust particles and allergens to keep the indoor environment much cleaner than before. 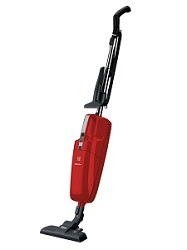 This is much different than other stick or lightweight vacuum cleaners that have only minimal (if any) filters. For those homeowners who have pets, Miele has another specially designed filter that can be optionally purchased. Their Active Air Clean design comes with a small amount of activated carbon to really cut down on those tell-tale pet smells. It is proven to trap and remove odors while still providing the same amount of filtering ability as their other options. Probably the biggest difference between the Miele Swing Powerline and your typical lightweight upright is the quality of the filtration. When you think about it this component is one of the most important that you will find on a vacuum. You want the air that comes out to be free of pollutants and this is where the Miele really shines. It is completely sealed which means that the microscopic dust particles you pick up will make their way to the various filters without escaping through any openings along the way. What good are high quality filters like HEPA if the dust doesn’t even make it to them? With the completely sealed system found on the H1 you can be sure that every time the air flows over any of their filters it is becoming much cleaner than before. It doesn’t matter if it is the standard Super Air Clean, HEPA filter, or activated carbon Active Air Clean it will do its’ job to perfection. Going hand in hand with their multiple filter layers is a dust collection bag that is revolutionary in its’ design. It is composed of all new materials that have enhanced the ability to not only capture the dirt but to make sure it stays trapped inside. It is composed of multiple layers of polymer fibers that are woven together to keep even the smallest of allergens in without sacrificing capacity. 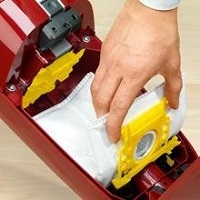 Plus, these materials have been tested to be puncture resistant to sharp objects which has traditionally been a problem with bagged vacuum cleaners. The IntensiveClean dustbag is specifically designed to work together with the filters to drastically reduce (and virtually eliminate) the particles coming out in the emissions. Cleaner filters also mean better performance since the air can flow freely through them without encountering any clogs along the way. Another great quality of the Miele Swing upright is it can be used on multiple configurations, with multiple attachments. The FiberTeQ Combination floor tool is what you would want when vacuuming low to medium height carpeting and even hard floors like tile, laminate, and hardwood. Portability is important with a model like this so you need the ability to handle just about any type of flooring. Also standard are your basic upholstery and crevice tools which are useful on furniture or in hard to reach corners. The telescopic wand isn’t built of cheap plastic like some other brands, but rather is stainless steel and can be adjusted for multiple heights. You can also add many other optional tools like the Miele STB 101 Hand Turbobrush, Round Swivel Dusting Brush, and the Universal Upright Hose & Wand Kit. It’s nice that some of their attachments work on multiple vacuums in their lineup, especially if you have a full sized Miele to go with the Swing. You can also use the motorized Powerbrush for deeper cleaning but remember that this model isn’t really designed for whole-house carpet cleaning. Overall, the Swing H1 Powerline is one of the best stick vacuums you will find today. It has a surprising amount of power, multiple attachments, and has the same technology in their filtration system that Miele has become known for. An optional HEPA filter is perfect for those who suffer from allergies and the activated carbon filter works wonders on pet odors. To read consumer reviews and check current pricing, click here to visit our recommended online supplier.